Links to this page can be found in Book 9, Map C3, Day 7, View D8 and Rione Regola. 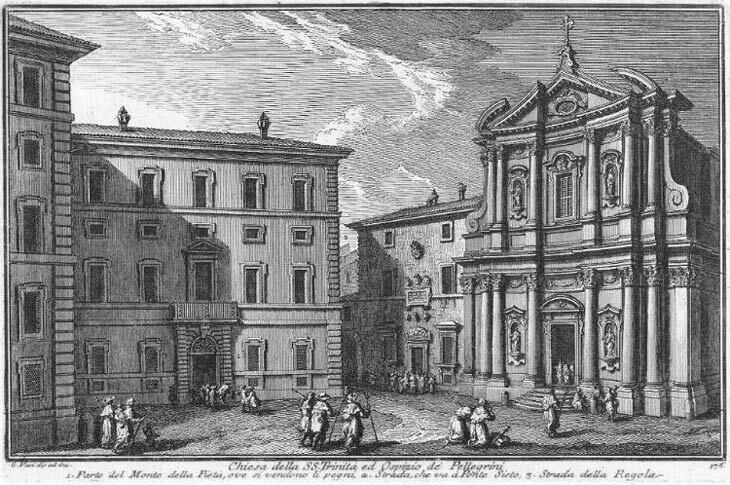 In this 1759 etching, Giuseppe Vasi showed a group of pilgrims on their way to Ospizio dei Pellegrini e dei Convalescenti, a charitable institution founded by St. Philip Neri to provide assistance to pilgrims during the Jubilee Years and the Holy Week; in ordinary periods the building housed convalescents. The etching was most likely based on scenes Vasi personally watched in 1750 during the Jubilee Year. The view is taken from the green dot in the 1748 map below. 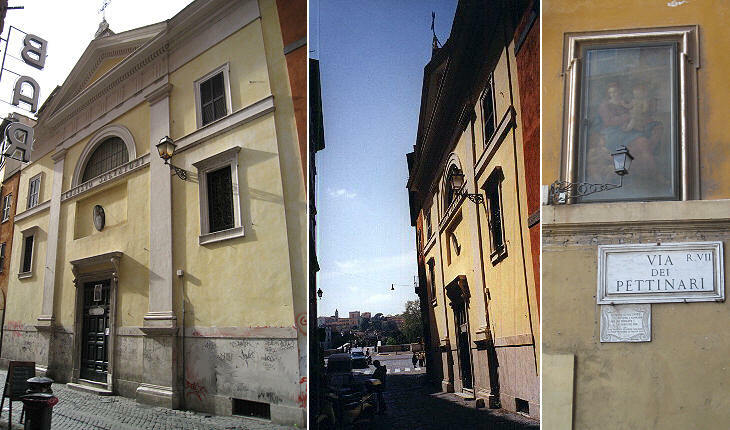 In the description below the plate Vasi made reference to: 1) Rear side of Palazzo del Monte di Pietà; 2) Street leading to Ponte Sisto; 3) Street leading to S. Paolo alla Regola. The map shows also 4) SS. Trinità dei Pellegrini; 5) Palazzo Salomoni Alberteschi; 6) S. Salvatore in Onda. Apparently only minor changes have occurred after the time of the etching: the top of the church façade has been slightly modified, the adjoining building has lost its coats of arms and the rear side of Palazzo del Monte di Pietà has an additional storey, but the modern building in the background indicates that all the refectories and dormitories of Ospizio dei Pellegrini were demolished in 1940. SS. Trinità dei Pellegrini was built in 1614-616, but the façade was designed by Francesco de Santis in 1723; it is slightly concave and reminiscent of that of S. Marcello; the tympanum had an oval window which was covered by a stucco relief having at its centre a triangle, a symbol of the Trinity (you can see it in the image used as background for this page). 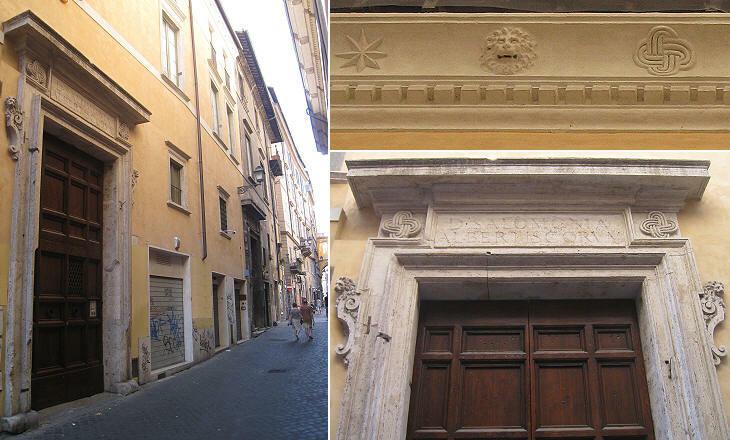 A small plaque to the left of the façade commemorates the death in the hospital of Goffredo Mameli and other military volunteers who fought with Giuseppe Garibaldi for the defence of Rome in 1849 (you may wish to see a page on commemorative plaques in the streets of Rome). 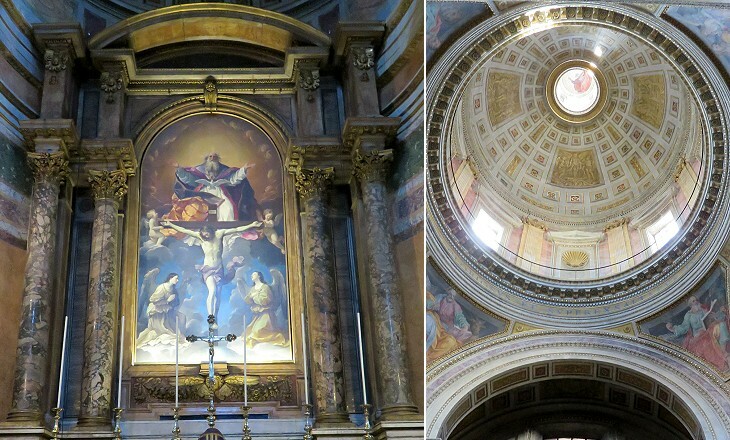 The church is one of the few historical buildings of Rome which still retains the reddish colour which characterized the city until a few years ago (see a page showing the changes which have occurred in the last ten years). Ospizio dei Pellegrini had separate wards for male and female pilgrims; the dormitories had nearly 500 beds and the refectories could seat nearly a thousand guests; in addition to the church the establishment had an oratory in Via delle Zoccolette, where at Vasi's time Jews had to listen to a sermon delivered by a Dominican monk on Saturdays. Almost the whole complex was demolished in 1940. At one point the management of the hospice felt the need to identify pilgrims from travellers in search of a free lodging; in 1843 Rev. Jeremiah Donovan wrote in his Guide to Rome: To be admitted as pilgrims they must come from a distance of at least sixty miles and bring with them the attestation of their bishop, certifying that they come to visit the holy places. All go to Confession and Communion during their stay, and hear a moral discourse morning and evening. (..) The reception of the pilgrims during the Holy Week is at once edifying and affecting. Bishops, Cardinals, Ambassadors, Princes and Kings, vested in sack-cloth, the uniform of the confraternity, wash and dry and kiss their feet, attend them at table, and serve them with more than menial humility and assiduity. The Alberteschi were a powerful Roman family during the Middle Ages; their towers were located behind S. Benedetto in Piscinula in a neighbourhood known as Ripa Romea where many Jews lived. Salomone was a recurring name in the family and it eventually identified a branch of the Alberteschi; when they built (or acquired) a large palace in Via dei Pettinari they decorated it with Solomon's knots, a traditional Jewish symbol (you may wish to see a Solomon's knot in an ancient synagogue at Ostia). Onda is the Italian word for wave and it is generally thought that the appellation of this small church is due to the fact that it was frequently flooded; because of this the medieval church was modified several times and its floor was raised. The current building, including the façade, is the result of changes made in 1845 and in 1877. 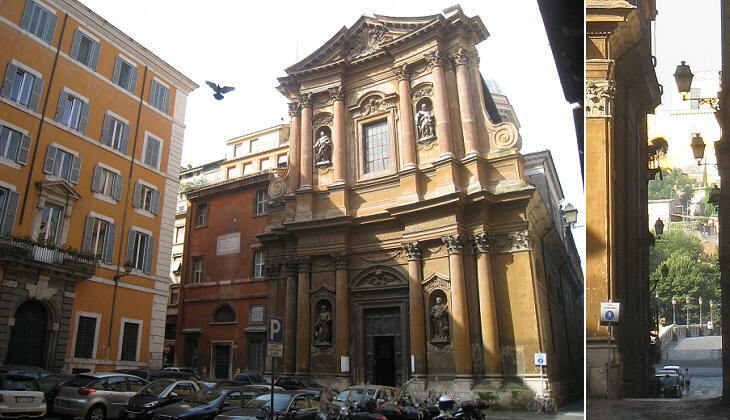 In 1844 the church was assigned to St. Vincenzo Pallotti and it still belongs to Societas Apostolatus Catholici (external link), the congregation he founded which from 1854 to 1947 was officially known as Pious Society of the Missions. Next plate in Book 9: Chiesa e Ospizio di S. Galla. Next step in Day 7 itinerary: Monte della Pietà. 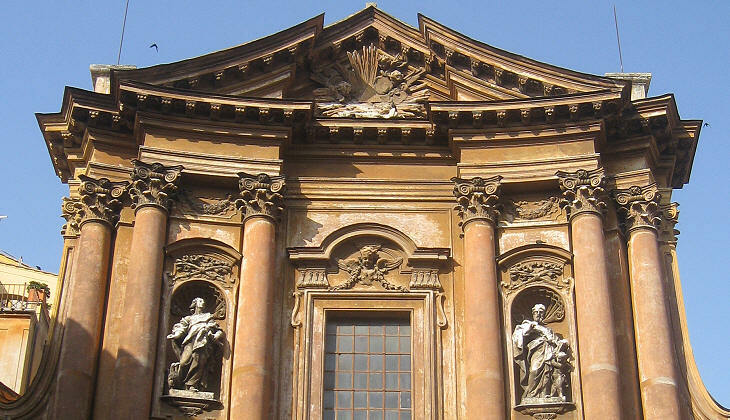 Next step in your tour of Rione Regola: Collegio Ecclesiastico a Ponte Sisto. 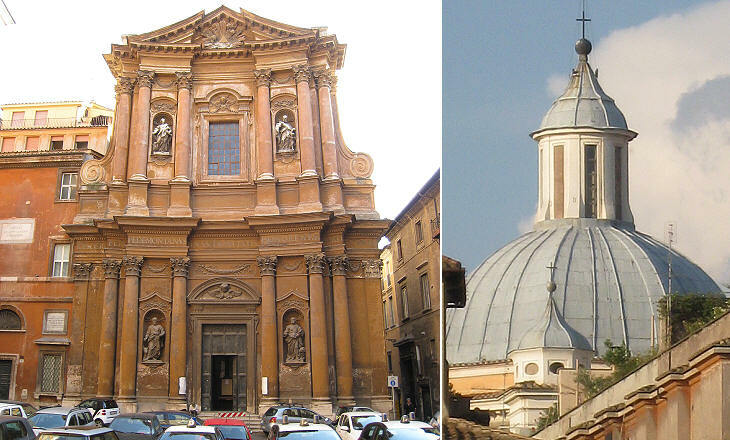 San Filippo Neri unito con alcuni Preti, e secolari dette principio alla grande opera dell' Ospitalità nella chiesa di s. Salvatore in Campo, formando una confraternita sotto il titolo della ss. 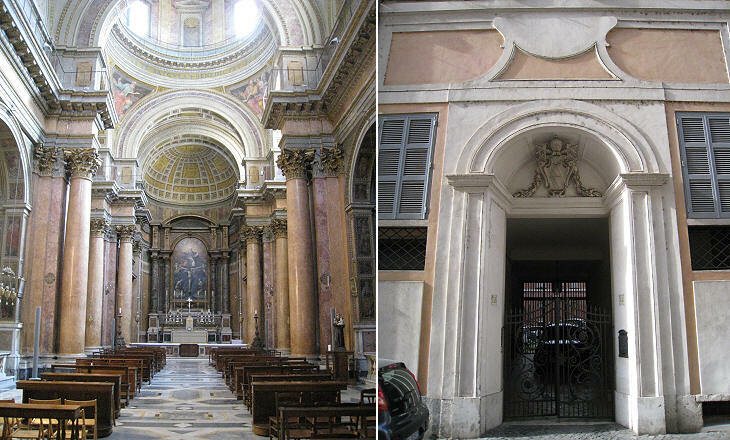 Trinità, e per esercizio di carità verso il prossimo, elessero di dare sollievo a' poveri pellegrini, che vengono a visitare i Santuarj, di Roma; tanto più che si avvicinava l'anno del Giubbileo, e perciò presero in affitto una casa, in cui con carità somma ricevevano tutti, e lavando loro prima i piedi, ad essi davano da mangiare, e da dormire per tre giorni. A quest'essempio si mossero altre persone pie, ed altresì lo stesso intrapresero le donne verso le pellegrine, dando per tal effetto una casa D. Elena Orsina dama Romana; e continuandosi sempre con fervore quest'opera di misericordia, l'an. 1558. fu loro conceduta da Paolo IV. la chiesa di s. Benedetto in Campo, che quivi era; ma poi rendendosi angusta alle sagre funzioni, che facevano que' fratelli, nel 1614. fu fatta di nuovo la chiesa con magnifico disegno di Paolo Maggi: il prospetto però è di Francesco de' Santi. Fra le pitture, che ornano questa evvi nell'altare maggiore il celebre quadro della ss. Trinità dipinto da Guido Reni, e fra le sculture la statua di san Matteo Ap. opera di Copè Fiammingo, ed altre sculture rimarchevoli con metalli dorati sono nel primo refettorio dell'ospizio. La memoria di Urb. VIII. fu modellata dal Bernini, quella di Clemente X. dall'Algardi, il quale fece ancora il busto di s. Filippo Neri, evvi ancora quella di Clemente VII. e di Clemente XI. e quella di Benedetto XIV. come benefattori. Oltre i pellegrini si ricevono in questo ospizio i poveri convalescenti, che escono dagli spedali, alimentandoli bene per tre giorni, e più ancora le bisognasse. Nell'oratorio segreto, in cui i fratelli sogliono fare le loro funzioni, vi si predica in ogni sabato agli Ebrei da un religioso Domenicano.